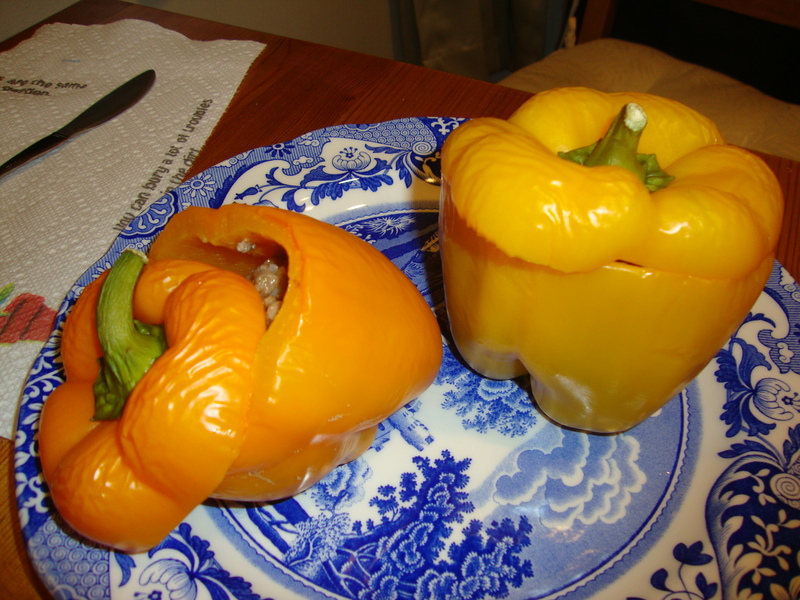 Stuffed peppers are the ONE recipe I have ever made that came out AWFUL (Dan can attest to that). I made them back at our old apartment and they were just completely flavorless and gross. I think we threw them out and ordered Albanese pizza. Fail. However, my mom made great stuffed peppers for me and Nicole this summer, so of course I took that lesson as a chance to redeem the score between me and this recipe. My biggest mistake when I first made them? Making them vegetarian style. smh (that’s kid slang for shakes my head, I’m down with all the lingo since I teach 7th grade, fah real). No offense to vegetarians, I’m sure there is a way to make these very delicious vegetarian style; I just don’t know it. -about 1 to 1.5 cups of fresh bread crumbs. I food processed a whole wheat hamburger bun from last week’s pulled pork, yum. In hindsight I would have processed 2 buns since my peppers weren’t fully stuffed. First get hot water boiling in a large pot (like you would for pasta). Next saute your onions in a large skillet with olive oil. Once these are softened a few minutes add in the ground beef. I like to use a large wooden spoon to break up the chunks of meat and push the meat around so all the pink disappears. Back to the peppers….Cut the tops off the peppers and remove the seeds and any weird inside skeleton stuff that I don’t know the name of. Keep the tops but set them aside. Once the water is boiling carefully place your peppers in the water with tongs (3 at a time). I had to push them down to sink them. 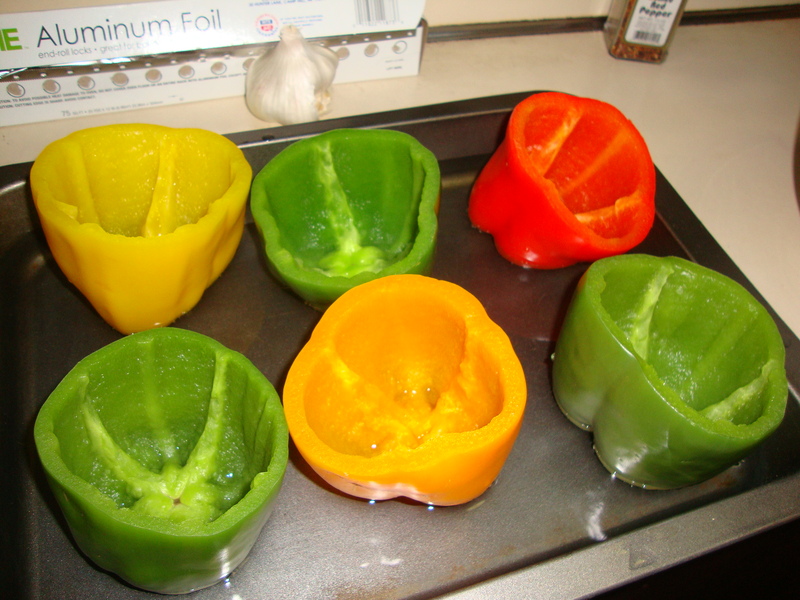 Let them soak for a few minutes and remove them (then do the same with the next 3 peppers). Arrange these in a deep cake pan. Around this time I would preheat the oven to 350 degrees (my oven heats up quickly). 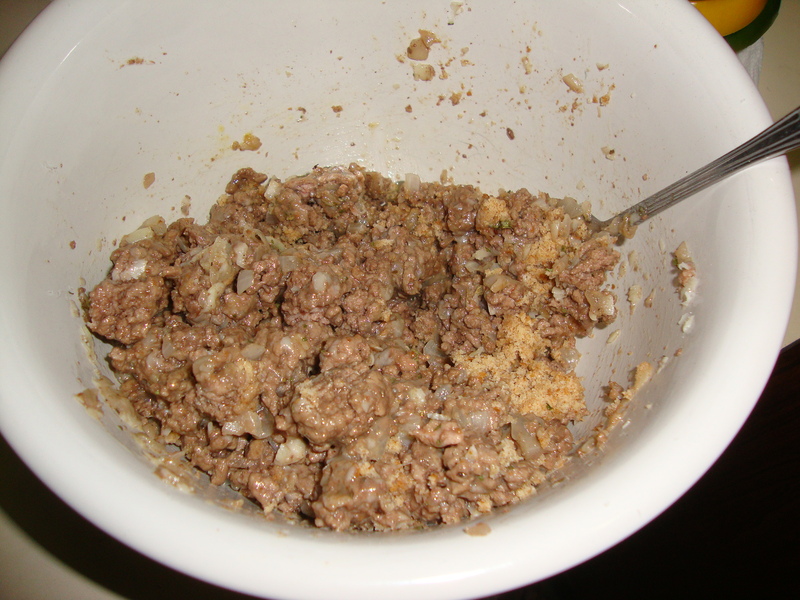 In a large bowl mix your no longer pink beef, onions, bread crumbs, cheese, 1 egg, dash of salt and pepper, and the parsley and basil flakes. 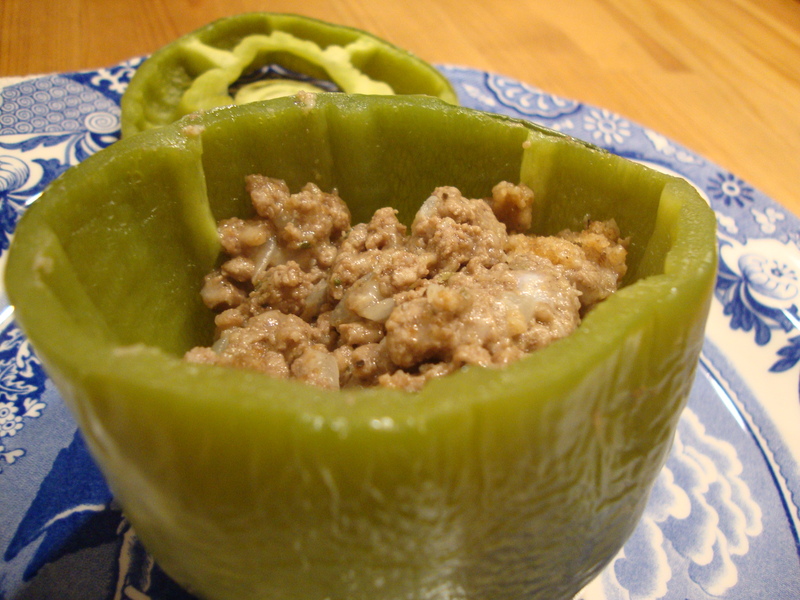 Using a large spoon, transfer the stuffing into your peppers. Once all the peppers are filled you can put the tops back on. Next, use a cup of water to fill up your pan about halfway with water. This ensures everything is nice and soft when you eat. However, it also means you need to be very careful when you are putting the pan in the oven and removing it. Cook for about 40-45 minutes. These are delicious, even if they aren’t the prettiest things in the world. Healthy too, could be good if you have a partner who likes burgers and beef but you want him or her eating less bread and more veggies. Thanks for the recipe Mom!